Almost 500 years old, the detail on this painting is in immaculate condition. Three figures are seen half-length against a dark background. In the centre of the composition, a woman dressed in blue holds a burning ember; on the right stands a man in yellow mantle and red cap, while on the left is seen a chained monkey. Signed in top right, Domenikos Theotokopoulos. Born in 1541in Crete, El Greco’s given name was Domenikos Theotokopolous. El Greco (The Greek) travelled through Italy and Spain, where he worked primarily painting religious works. 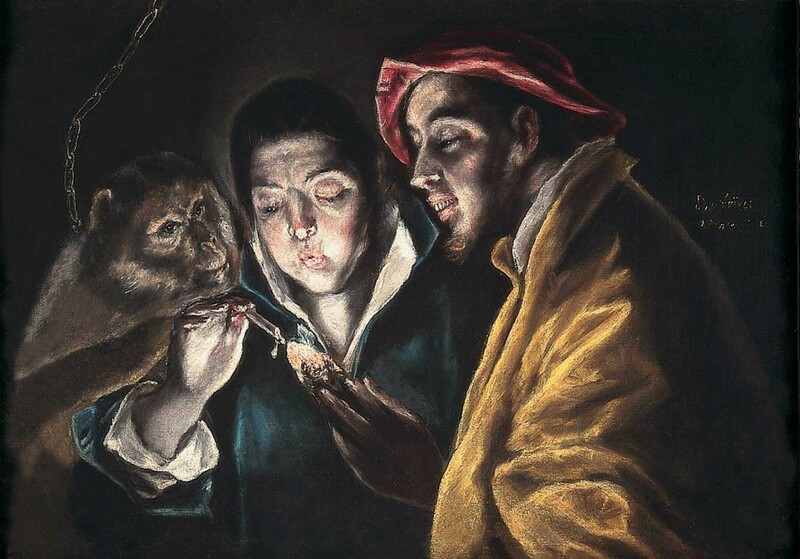 El Greco also produced allegorical painting, and it was after he settled in Toledo that he painted several versions of this intriguing subject. The boy blowing on a burning ember was a motif taken from a description by Pliny of an ancient Greek painting. 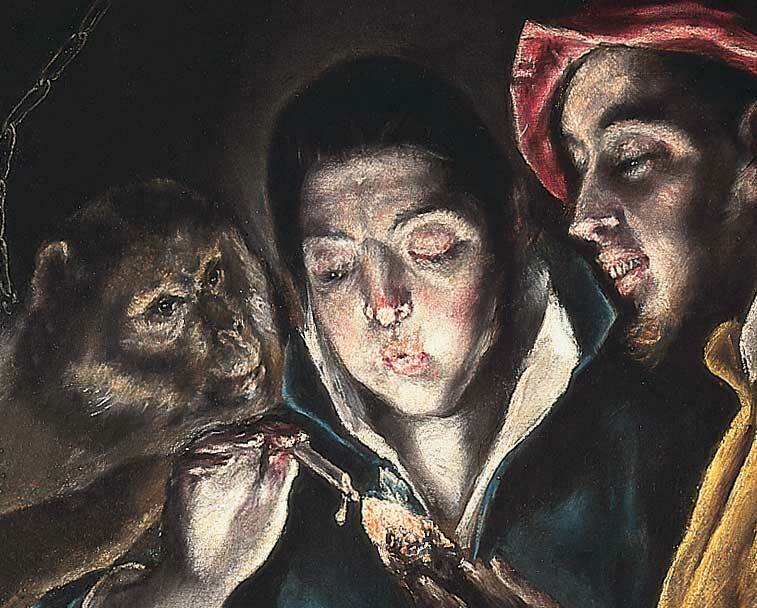 To this figure, El Greco added a monkey and a grinning fool, creating a subject with a moral message, possibly a warning against the dangers of lust. One interpretation is that the figures relate to an old Spanish proverb ‘Man is fire; woman is tow; then comes the devil and blows’. After his death, El Greco’s work fell into relative obscurity. It was not until the late 19th Century that an interest in his highly individual manner was renewed. Artists such as Pablo Picasso and Jackson Pollock were heavily inspired by El Greco’s form, light and colour. Oil on canvas.